Everything worked fine and I was able to quickly set up two shortcut icons to help toggle network and provide the network status. However, while checking out the WiFi shortcut I inadvertently gave some permission to this app, that in turn allowed it to toggle the WiFi, Bluetooth etc. All I can remember now is seeing a box asking me to give permission to the app so it could toggle system functions like WiFi, Bluetooth etc. Since, then I've been trying to withdraw this permission, but I can't even see this in the permissions tab! See screenshot attached. More Shortcuts is also listed in the Device Adminstrator section but thankfully it's not got automatically enabled. I also uninstalled this app, and guess what? When I reinstalled it, it never asked me for permission to toggle system WiFi etc.! How do I withdraw this permission? Please help! Sorry, I don't see a screenshot. Can you post it again? 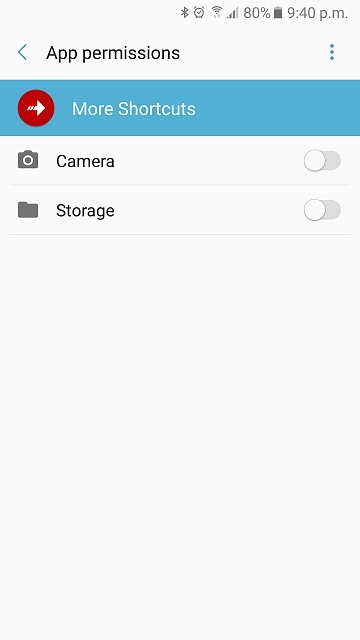 Try going to Settings>Apps​, select the app, then Clear Cache/Clear Data. Also, what device do you have and which android version is it running? Try this. Go to settings - apps - cog icon top right - app permissions - additional permissions and see what you can find on those two lists. Already done this, and even uninstalled More Shortcuts. But when I reinstalled it never asked me for permission to change system settings like WiFi or Bluetooth. And now, it automatically makes those changes as and when required. I've just bought a Samsung A5 (2017) running on Android M 6.0.1. Yes, already done that and I don't see "More Shortcuts" listed anywhere. But then there are no sections here on access to WiFi, Bluetooth etc. Go to your Google Dashboard on your desktop browser (google.com/settings/dashboard), and look under the Android heading. See if More Shortcuts has any backed up data there. If so, you could Delete Backup Data. Make sure you uninstall that More Shortcuts app first. Don't worry about other backed up data -- the phone should create another backup promptly. Thanks for this I checked that out, but under the Android heading all I can see are two devices listed - my current and previous phone. I also checked the other headings, and More Shortcuts is not listed anywhere, except under the Play Store apps list. I am confused as to who an app can continue to hold on to a permission despite being uninstalled so that next time it's installed it doesn't even need that permission. Last thing I can think of to try would be Settings>Security>Clear Credentials, but that probably won't do much. You may want to contact the app's developer to see if they can answer your question. I also edited your post to get rid of the duplicate photos. Any way to remove NFC and alarm clock from status bar without root?